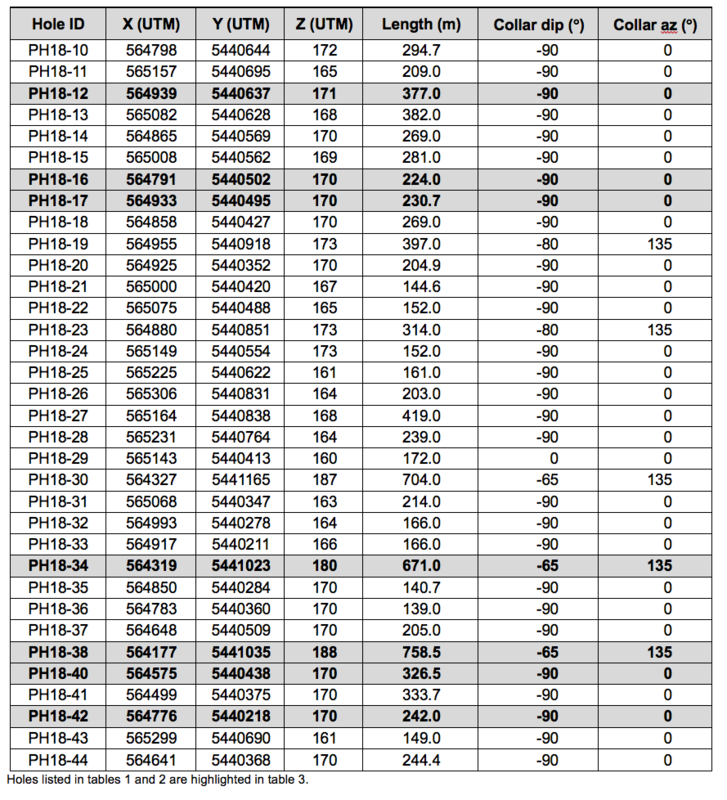 Montreal, March 20, 2019 – Champion Iron Limited (TSX: CIA) (ASX: CIA) (the “Company” or “Champion”) discloses strong results from its 9,350-m drilling campaign completed in the fall of 2018 at its wholly-owned Powderhorn property, located in North Central Newfoundland, 40 km southwest of the town of Springdale. 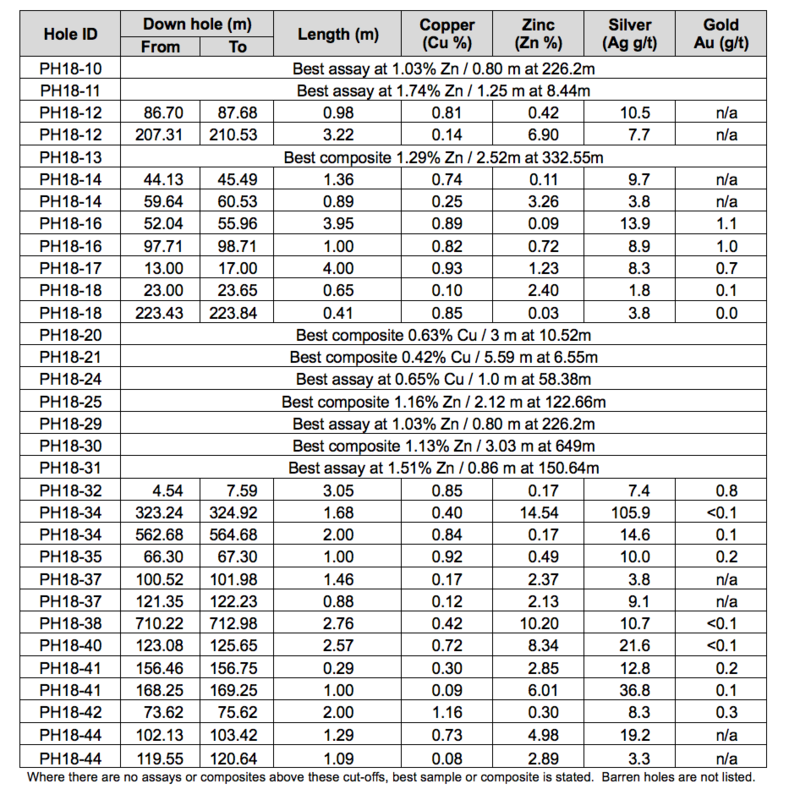 The drill program was designed to test the lateral continuity of the zinc-rich intervals intersected by Champion in the spring of 2018. 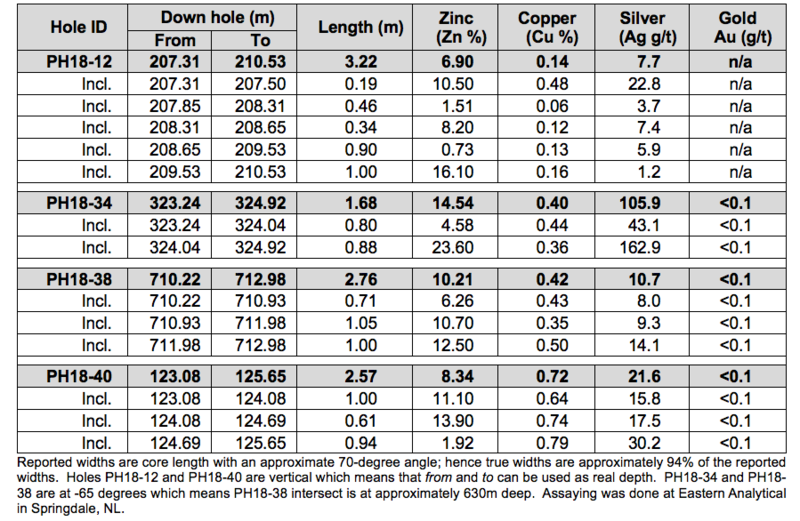 Several drill holes yielded significant zinc values, including one interval in PH18-34 which returned 23.6% zinc (“Zn”) and 163 g/t silver (“Ag”) over 0.88 m. This high-grade sample is part of a mineralized layer that locally reaches 4.5 m in thickness (see Champion’s August 15, 2018 press release). 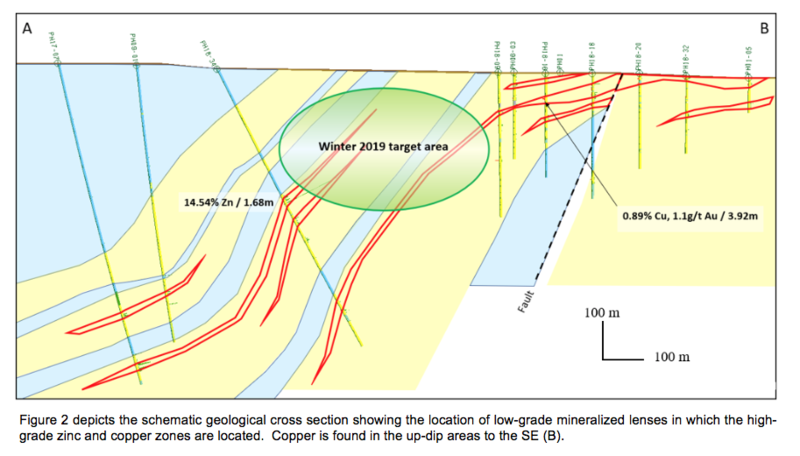 The copper zone interpreted from previous work was also intersected and carries gold grades above 1 g/t. 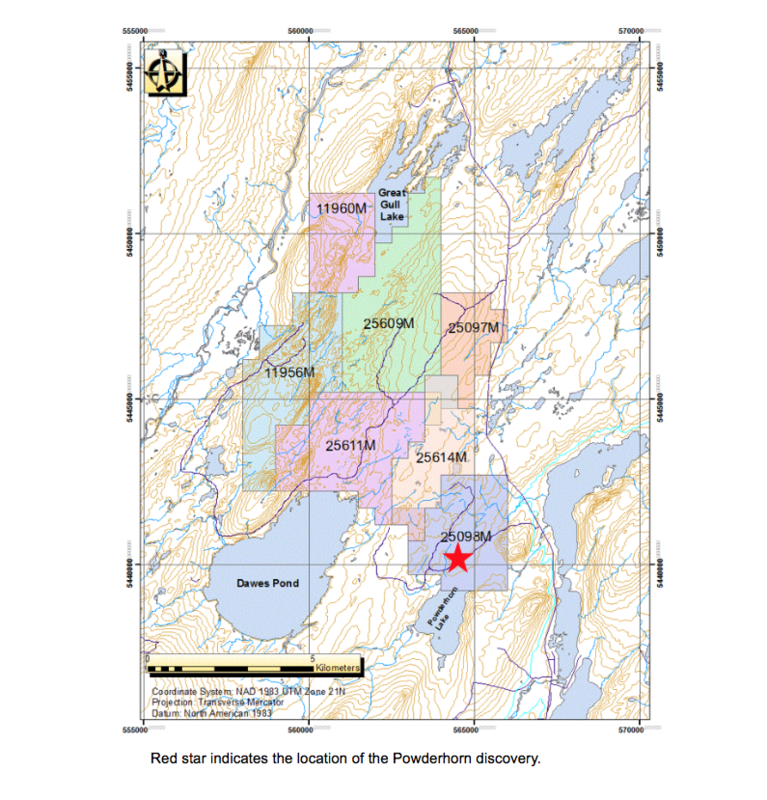 Powderhorn, originally considered a zinc project, can now be viewed as polymetallic. Champion Iron’s board of directors approved an additional 4,000-meter drilling program targeting the area between the shallow SE area the deeper NW zone. The ongoing program has been scheduled during the ice freeze-up in the winter months to minimize and prevent any damage to the wetland environment. Discovery of sulphides in the area date back to 1940 but it appears that those were related to sediment-hosted pyrite and pyrrhotite. Zinc mineralization was found later along the shore of Powderhorn Lake and in a boulder located along a logging road. Although the property has been owned by several companies, exploration to date has resulted in limited drilling (less than 12,000 meters). 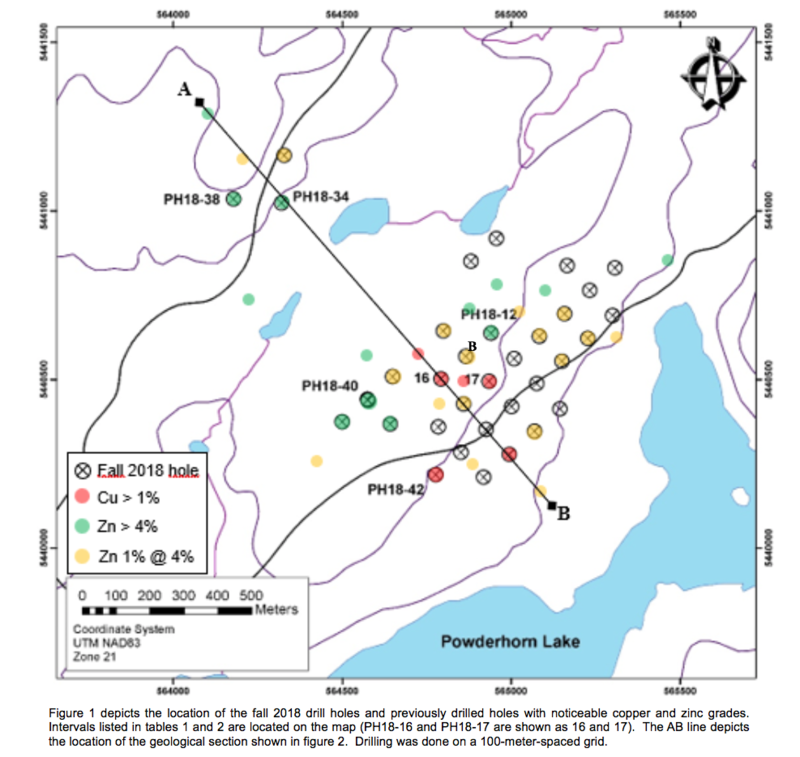 Champion’s exploration strategy at Powderhorn has been to identify geophysical anomalies underneath the sedimentary rocks that overlie the mineralization-bearing felsic volcanic rocks. Drilling these anomalies was completed in 2017. In accordance with National Instrument 43-101, Dr. Hugues Longuépée, P.Geo. is the Qualified Person responsible for the technical data reported in this press release. He is a Professional Geologist registered in Québec and in Newfoundland and Labrador. He is the Geology Manager at Champion Iron Mines Limited and has visited the field and core logging facilities on several occasions and validated the data (QA/QC).